An employee stands at the door of a Louis Vuitton shop in Ho Chi Minh City, Vietnam, February 24, 2011. Louis Vuitton, one of the oldest fashion houses, is fighting claims of racism after a Central London store employee alleges in a legal filing that he overheard his manager say to an African employee: "Black people are slaves who eat dirt off the floor," the Mirror reports. Oliver Koffi, a sales associate at the store claims while packing a pair of shoes for a customer in the storeroom, he also overheard the manager call President Barack Obama a "muppet" and that "Miss Piggy" would make a better president because "Muslim people … don't eat pork." The news became public after Koffi filed a racial discrimination and harassment suit that is set to be reviewed July 18. In the paperwork viewed by the U.K. tabloid, Koffi claims his manager's comments came during a conversation being had about the history of the English language with three other staff members at the Louis Vuitton Townhouse at London's Selfridges department store. "During this discussion, my manager quite randomly stated that 'Black people are slaves and eat dirt off the floor,'" Koffi told the news tabloid. "This comment was grossly offensive and extremely humiliating. His ­reference to slavery in this day and age with regards to black people is quite frankly revolting." Koffi, who was a contract worker at the time of the alleged incident, told Mirror that he recorded the comments on tape as they became more frequent and absurd. "He went on a rant about black people and other races and religions. He jumped from subject to subject, making comments about other races and religions. He made comments about Barack Obama," he told Mirror. "All of his comments were derogatory and a clear illustration of his prejudices towards other races and religions. His comments were offensive and degrading. I confronted him about his statement … I told him that I was offended by his comment. He did not deny making the comment. He apologized and claimed it was a 'joke.' It was not a joke at all." Koffi claims that he was often asked, "Where are you originally from?," and noted and that the manager often "referred to customers by their skin color," the Mirror reports. Koffi told the tabloid that the manager left Louis Vuitton after a disciplinary hearing. "Louis Vuitton has a zero-tolerance policy to harassment of any kind," a Louis Vuitton spokesperson told the Mirror. 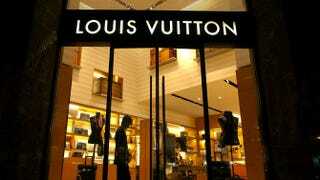 "This reported sentiment is in total violation of the Louis Vuitton ethical charter. This issue was investigated, and the manager in question no longer works within the company."